Wait a second, so Sen. Dianne Feinstein (D-CA) sat on a secret letter given to her by Christine Blasey Ford, who alleges that she was the victim of an attempted sexual assault by a drunken 18-year-old Brett Kavanaugh 30+ years ago for weeks. Feinstein obtained the letter in July and then dropped it at zero hour last week. Judge Brett Kavanaugh, who has been nominated to fill the vacancy left by Anthony Kennedy on the Supreme Court, looked as if his confirmation was a guarantee. Now, chaos has engulfed the process. 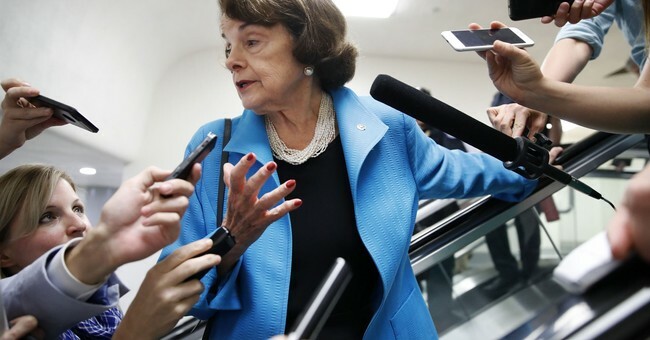 Feinstein wants scores of witnesses. Sen. Chuck Grassley (R-IA), the chair of the Senate Judiciary Committee, says he will hold a hearing on Monday. The problem: Ford has gone AWOL. Now, after all of this, Feinstein isn’t sure if Ford is being totally truthful. From Fox News’ Chad Pergram, Feinstein said, that Ford “is a woman that has been, I think, profoundly impacted, on this…I can't say that everything is truthful. I don't know." Feinstein to Fox when asked what will happen if Ford doesn't appear Monday. "I have no say. It's all up to the Republican(s)..."
Excuse me, you’re not 100 percent sure that the allegation she’s making is…truthful. First of all, Feinstein later says that Ford wasn’t a woman who wanted to go public. That’s crap. She took a polygraph administered by a former FBI agent, who is nameless, and as the Wall Street Journal noted, took steps that one would take to go public when the time arose. She retained lawyer Debra Katz, who is really a Democratic operative, for representation. It’s so transparent—this whole circus. The accusation is so old and cannot be truly verified. And that’s the point. It’s the doubt, the lingering cloud of controversy to smear Kavanaugh. Even if Kavanaugh is confirmed, he’s going to be tainted. If you can’t beat him, hobble him. It’s appalling. And no doubt Democrats also want to try and block him, using this controversy to drum up anti-Trump hate, get their base motivated for the 2018 elections, and hopefully, have a better position on the Hill next Congress to further muck things up for Kavanaugh and Senate Republicans.